​To schedule a presentation, email weber@sandraweber.com or call 518-873-1137. This lively program of photos, prose, and portrayals explores the Portrait Monument. 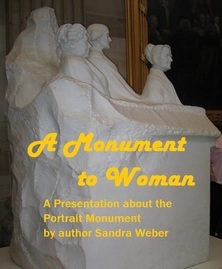 Author Sandra Weber delivers dramatic narratives of Mott, Stanton, Anthony, Johnson, and other women as she illustrates the artistry and history of the Portrait Monument---from the top of the mysterious fourth figure to the bottom of the new base, from the exquisite Carrara marble to the strange unfinished marks, and from Abigail Adams to Sojourner Truth to Alice Paul to Olympia Snowe. Even in marble, women will not be silenced; they speak and question and step forward. The voices and spirit of the woman’s movement come alive in "A Monument to Woman." A woman’s sphere has no limit, especially in the six million acres of the Adirondack Park. A woman can step outside her appointed role and reach the peak of an Adirondack mountain and the bottom of an Adirondack pond. She can grip the handle of an ax, row an oar, cast a fishing rod, or click a camera. She can ride the bare back of a bronco or craft poetic prose or fight illness or injustice. This lively program of readings, portrayals, and songs tells the stories of remarkable Adirondack women. Dressed in period costume, Weber delivers dramatic narratives of women such as pancake-flipper Mother Johnson, adventurer-actress Kate Field, poet Jeanne Robert Foster, and suffrage martyr Inez Milholland. The voices and wild spirit of these women come alive. They will not be silenced; they will be echoed. ​Musician David Hodges adds some music and song throughout the program. Suffragist Inez Milholland, a graduate of Vassar College, was also a reform worker, athlete, socialite, English suffragette, lawyer, and persuasive speaker. She exhausted herself campaigning for women's right to vote in 1916 and died at the age of 30. Her grave is in the Lewis Cemetery amid the Adirondack hills. After her death, Inez became an iconic symbol that inspired the National Woman’s Party to intensify their efforts for Votes for Women. 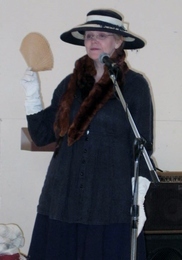 Using costumes, props, and music, Sandra Weber portrays the life and legacy of the woman who made suffrage fashionable---Inez Milholland (Boisssevain). Actress, journalist, and lecturer Kate Field visited the Adirondacks in 1869 and the woods were never the same. She advocated for women to camp out in the wilderness (and to fish and hunt)---to the dismay of some "sportsmen." She campaigned for preservation of the woods and waters. And, she helped purchase and preserve the John Brown Farm in North Elba. Watch as Sandra Weber transforms from proper "society lady" to plucky woodswoman. Author Sandra Weber and musician David Hodges, in period costume, weave narrative and song to present the life of Mary Brown. The poignant piece shows the significant role this plain woman played as the wife of radical abolitionist John Brown. The program presents Mary's early life and marriage, as well as the later tragedies of bankruptcy, accidents, and death. The ending of the program focuses on the aftermath of the Harpers Ferry raid when Mary faced her hardest times of trouble. Like most women of the 1800s, Mary Brown remains in the shadow of her husband, radical abolitionist John Brown. The roles of Mary as wife, mother, nurse, head of household, confidante, and abolitionist have gone unexplored and unrecognized. Our aim is to bring alive the persona of Mary, through her words and the words of those who knew her. We want you to meet her – and recognize her place in history. Sandra often uses photographs, art, poetry, and/or music to enhance her narrative. I currently serve as the Leader/Coordinator of the Writers' Critique Group at the Elizabethtown Social Center. I am also available for presenting group writing workshops or serving as writing coach for individuals.